Space Apaches "Smile" / "Sunrise" / "Desert Life"
Space Apaches like to do things a little bit unconventional. Instead of being pigeonholed into one genre and limiting themselves to the expectations that go along with it, their mantra is create that makes you feel good! Perhaps due to the fact that their primary objective is recording, this group of talented studio musicians are able to easily hop between styles and genres. Whether it be a classic rock feel, “spaced out” country, or even a gothic rendition of “Ghost Riders In The Sky,” there are few challenges they present themselves that they cannot tackle. It’s appropriate that we’re bringing three Space Apaches for you to chew on, so you can get a true feel for the diversity of this group. First is “Smile.” A song that references the late Edie Sedgwick and Andy Warhol’s famous “15 minutes of fame” quote, the song takes a hard look at a culture of being expected to perform and to be things that are not true within ourselves. The “Smile” video is an artistic piece that is shot in black and white and uses just a touch of special effects to create something straightforward and compelling. The band performs, and a handful of characters and silhouettes simultaneously strut their stuff for the ever-present camera. “Sunrise” is a song that reminds everyone that it’s your life, it’s your time and it’s your mind! Visually, it shares some traits with “Smile,” but with a bigger dose of psychedelic colors and some of the Apaches beloved sense of humor. 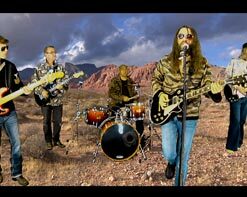 The band is again the focus of attention but the accompanying characters once again do their part to shape the tone of this mind bending video. Lastly, we’re bringing you “Desert Life,” a song that is possibly the most free formed and outside the box yet. The song is a slow burn but keeps a restrained energy at the forefront throughout. Visually, it’s also the most daring of the three. It begins using a pseudo-animation to turn some of the most mundane activities in life into something compelling, like siting at home watching TV. But when the action jumps inside the TV it just gets more and more obscure and hallucinegenic. All in all, we get a taste of the many sides of Space Apaches, and they all deliver in a big way! We’re super excited to be working with this unique outfit, and are hopeful that you will support all of these clips. Please contact Andy Gesner and the HIP Video Promo team at (732)-613-1779 or email us at info@HIPVideoPromo.com for more info. You can also visit www.SpaceApaches.com/ or www.artistsii.com/.